So here I am with no more time to test at SFE during the day and no obstacle avoidance, still, and basically not much shot of anything. But I did realize something.The problem isn't simply gyro bias. It's that the Kalman Filter isn't able to merge Gyro heading rate and GPS heading together if the truck turns too sharply. 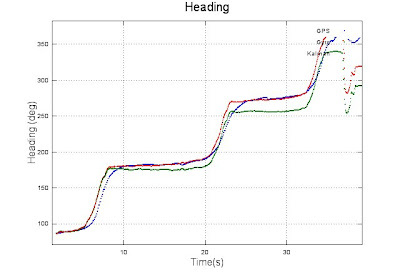 Here's a plot of heading from an early run where I made it around the building (albeit bouncing off a curb). 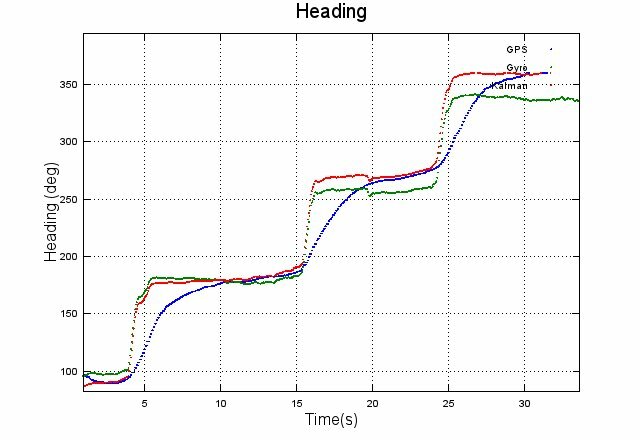 Notice how the Gyro heading (green) drifts pretty fast but the Kalman estimate (red) is close to the GPS heading (blue), while still retaining some dynamic range from the gyro. Here, the robot made turns at about 5 m/s or about 30°/sec heading rate. 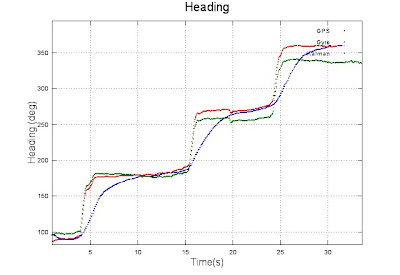 Here's a plot of heading data where the robot turns much more sharply. 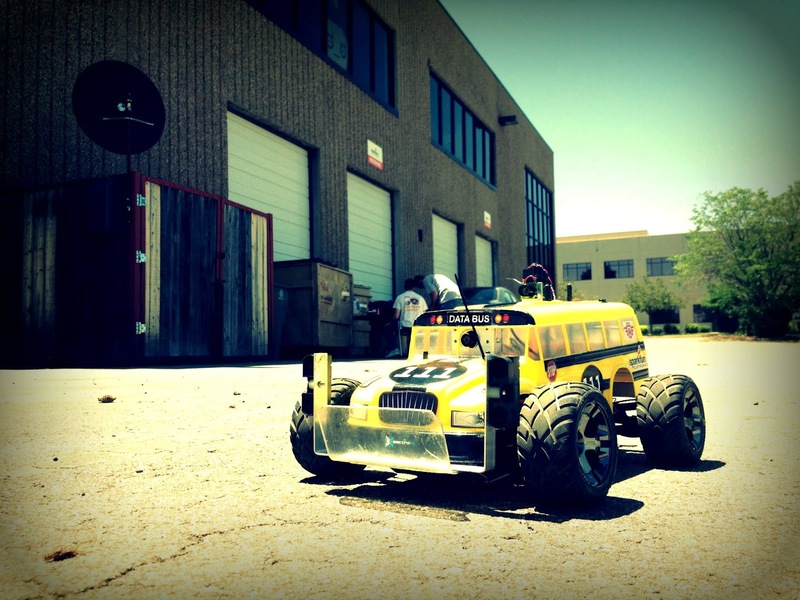 It was traversing the corners at 6m/s with a small turn radius resulting in a heading rate far exceeding that of the GPS. 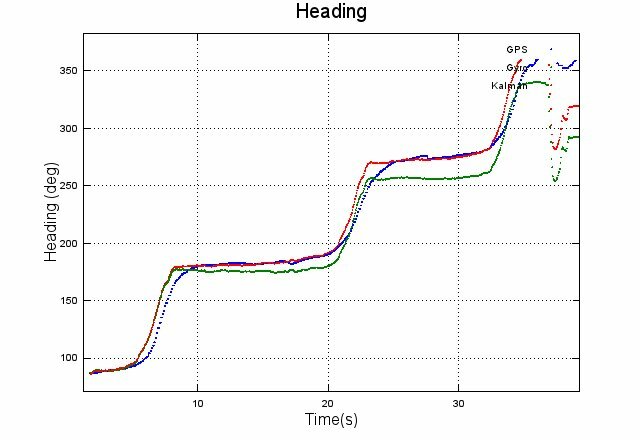 While the Kalman estimate (red) does seem to track the GPS heading (blue), but during high dynamics, the calculated heading is influenced more by the bias and all it takes is a few degrees to send the robot into a curb. I'm making a late-night run to Boulder to test my theory. It probably will turn out poorly but one can always hope.